Left Chicago for a 12 hour drive to Baltimore for Nachum Caplan’s wedding. I had 15 hours to make the afternoon wedding in Baltimore. 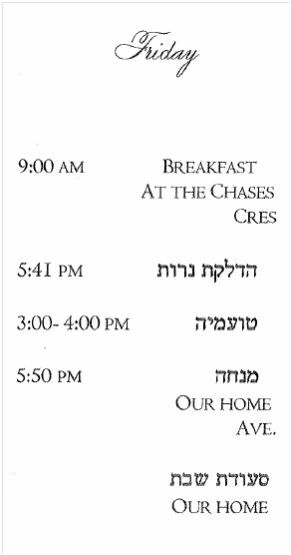 2:15 PM Kabulis Ponim and 3:00 PM Chuppah. I folded the seats in the second and third row so I would have a comfortable place to sleep. I had my son Eli download Torah classes. I first listened to two Blatt of Daf Yomi. I was frustrated because I could not think through my drowsiness to fully understand the Shiurim. Pulled over at 1:30 PM to sleep for an hour and again at 4:00 PM. I got up at 6:30 AM. I was still tired, so I purchased a 5 hour energy drink. The drink hit me with a boost of energy and I was wide awake. I used up my three hour window, so I had to put the pedal to the metal. I listened to two classes on Zionism from Rabbi Mordechai Torczyner given in Toronto. The classes were: The Roots of Anti- Zionism and the Unique Zionism of Menachem Begin, Was Menachem Begin a Religions Zionist. Great lectures. One thing that was said is that one of the reasons for opposition to the Zionist movement was the way the religious Jews were supported. They had no economic base. It was done from donations collected from Hungary and Poland and divided among the people. Israel was to be a spiritual place only. The Zionists wanted to build up a land so that the jews in Israel would be self-sustaining. My great-great grandfather, the Kozker – Pilaver Rebbe wrote in the 1880’s in his prophetic book, Sholem Yerushalim, that there is no commandment to live in Israel and be supported by donations from outside Israel. Israel is to build up as an agricultural society and be self sustaining. When I saw this, I understand the opposition to my great, great-grandfather. I believe that this idea was also the position of Rabbi Yosef Chaim Engel, the author fo the Gelyon Hashas. I had a problem as I would be pulling into the wedding right before the ceremony. I would prefer a shower, however I did not think it would happen. My mother called me a 1:00 PM that the caterer, Simcha Gross (who shadowed the holy Reb Naftoli in camp), would help. I called Simcha Gross and he told me that I can shower and change at the wedding hall. Problem solved thanks to my mother. I pulled in at 2:56 PM, met Simcha Gross, thanked him profusely, showered, changed, and made it to the wedding as they were starting the Bedecking. I wished everyone a Mazel Tov. It was great. I was the sole representative of my family. My aunt, the grandmother of the Groom teared up when she saw me. The 12 hour drive and lack of sleep was all worth it. 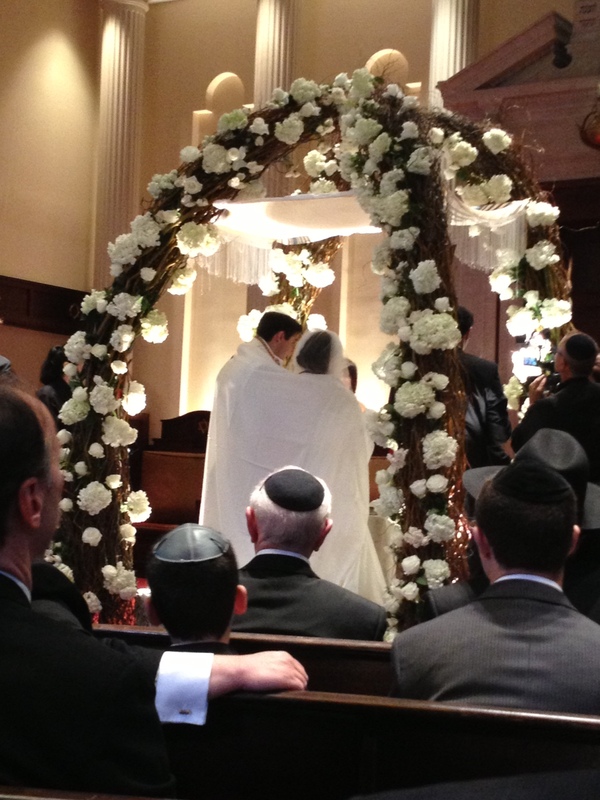 Bonus – Rabbi Efrem Goldberg came in for the wedding. I thanked him for everything. Even better, Rabbi Jonathan and Mashie Gross, the Rabbi in Middle America, were at the wedding. Mashie is from Baltimore and they were visiting her parents. Great wedding. Good meal. Thank you Simcha Gross for putting out the smorgasbord food during the meal. Everyone was happy, much dancing. After the wedding went to my cousin’s house, Elya and Chanie. Got a chance to catch up with this side of the family. My aunt was there along with some of her kids. Great conversation. Went to bed at 12:30 AM. In Baltimore, right after the wedding at Shomrei Emunah, I met a man whose wife is a descendant of Rabbi Samson Raphael Hirsch (1808-1881). I expressed my love of the book of Haphtarah’s from Rabbi Samson Raphael Hirsch. Among Rabbi Samson Raphael Hirsch’s themes is the need for Jews to be the Light to the Nations. I also see Zionism as a major theme. I reconcile the Zionism of Rabbi Samson Raphael Hirsch to religious Zionism. He said that Jews can only go back to Israel with God bringing the messiah and the Jews have to wait in Europe and America. Had Rabbi SRH seen the Dreyfus trial, the Kishinev massacre, spoken to Herzl, and read Moses Hess’s Rome and Jerusalem his views would have changed. Opened my eyes at 7:00 AM. Stayed in bed as it was the morning after. I felt a headache coming on, so I stayed in bed. Made it to the Agudah at 8:20 AM for morning prayers. Went to visit Rabbi Jonathan Gross’s father in law, Aaron, Mashie’s father. I had a great visit. We are very much alike and enjoyed his company. They have a lovely home. Aaron has a mini-farm in his backyard. He gave me two bottles of his home-made wine. Aaron and his wife grew up in the 60s and 70s. We shared stories. Aaron should be teaching kids farming, carpentry, and other practical courses. He would be perfect. At 10:30 AM left Baltimore. This is an e-mail sent to my family on 6/29/2008. A beautiful Vort on this week’s sedra is in the e-mail. It has been a while. I hope everyone if fine. It is a quarter-end at work and I am busy. But then, I am always busy. Last Wednesday we had lunch with Kenny and Tzippy who were in Chicago for a wedding. Shoshana, Danny, Tova Tamara, and Tiferet Tzippora moved to Indianapolis. They are settling in. I am trying to get into marathon training. I ran 6 miles today, not enough. The weather was perfect at 70 degrees. Martin– How is your running going. I am looking forward to December. Menucha – please send me stories about your father, what he stood for, what he said about his family in Europe. Why he left Europe, etc. etc. Write a biography about your parents. Thanks. The following is the words of Torah, I developed and spoke out this Shabbos. I have attached a scan of the sources. 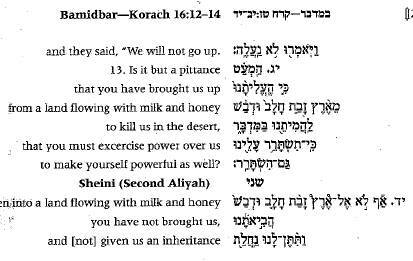 1) In this past Shabbos’s Torah portion – Korach challenged Moshe’s leadership. Korach initially appears to be motivated by spirituality, however, he aligns himself with bad characters, Dasan and Aviram, the same Dasan and Aviram who were Moshe’s enemies from Egypt. Who can forget Edward G. Robinson’s great portrayal of Dasan (or Dathan) in the movie, the Ten Commandments. I read that Edward G. Robinson was the only Jewish actor in the movie. 2) Moshe sends a messenger to Dasan and Aviram to meet with Moshe and try to make peace. Dasan and Aviram reject’s Moshe’s olive branch, refuses to meet with Moshe, and sends a verbal assault via the messenger back to Moshe, as conveyed in verses 13 and 14.. When someone has an argument with another and is able to respond to his antagonist, the person has satisfaction (he is able to answer the verbal assaults). However, when the person being attacked – the victim, cannot answer his antagonist, the victim has pain, grief, and aggravation. Dasan and Aviram challenged Moshe’s leadership. They did not appear before Moshe with their attack, so that Moshe could not respond to them. Moshe tried to make peace, they turned on him, and got the upper hand. Moshe was publicly humiliated, embarrassed and he was distressed. I want to add another meaning of the Medresh. The Medresh employees the words . These words imply personal satisfaction and not answering your enemy or being victorious. I want to say that the Medresh is telling us a comment on human psyche. If we are fighting with someone and we answer that person, we have personal satisfaction and we are at peace with ourselves. However, if we do not answer a verbal assault on ourselves, then we have pain and anguish. It eats away at us, with negative, negative results. It can take years to forget the hurt. A personal story to illustrate. Years ago, two distant cousins of mine were talking to one another and the older gentleman tried to humiliate his younger cousin. He said that he does not see how his cousin is a Kotzker descendant, because his cousin was not sharp. Neither my cousin nor I, who witnessed this exchange, answered these older gentlemen. The younger cousin was silent in the face of a verbal assault. 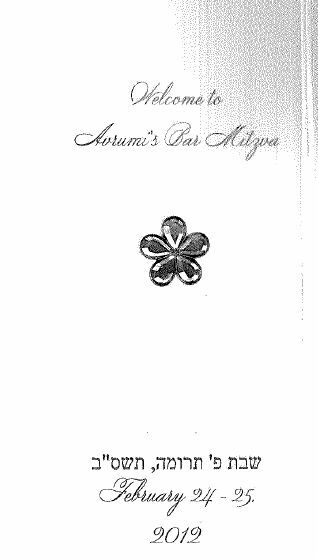 He should have said and could have said that the older gentlemen was at one time the Rabbi of a non-Orthodox Synagogue, that he is not trustworthy, that his business ethics could be questioned, and that it is doubtful that he served Kosher food in his business to Jewish residents. Today is the Yahrzeit of my mother’s grandmother, (Alta) Chana Henya Sklar , who left this world on the first of Iyar, April 27, 1933. (Alta) Chana Henya Sklar was the mother of my Zeidi, Reb Sholom Sklar. 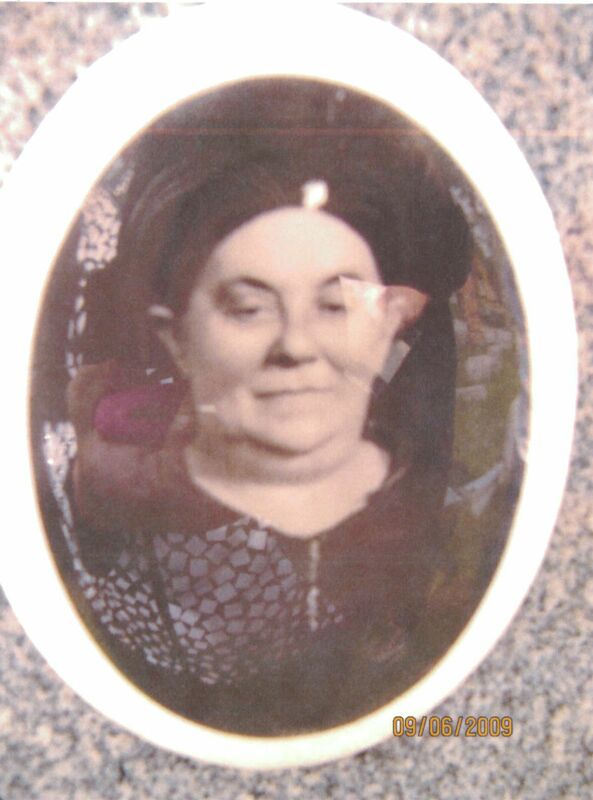 She was known as the Yunge Bubbe (young grandmother). I would like to wish everyone a holiday that is joyous, festive, and inspiring. Mazel Tov to Daniel and Chayala Glenner of the birth of a son, and to Menachem Mendel and Shoshana Janowski on the birth of a son. Daniel and Chayla named thier baby Yehoshua Nissan, after Chayala’s great – grandfather and a great-great grandfather. Menacham Mendel and Shoshana’s baby’s Circumcision should, God willing, take place on Shabbos, 3/24/13. Mazel Tov to Yossi and Elisheva Chase on the birth of a daughter, this past Tuesday. 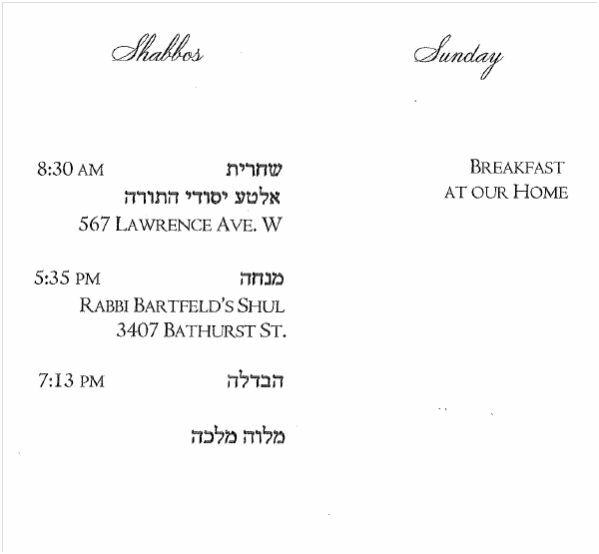 The baby naming and Kiddush is this Shabbos at Bais Chaim Dovid East, Rabbi Menachem Fine.